It's that time of year again: the Northern American Aerospace Defense Command (NORAD) is partnering with Google to track Santa, so all the world's good boys and girls can follow along online. This is not just an opportunity for you and your kids to see how close Santa is to your house, but it's also a chance to teach your children a little something about the world. Santa began his annual journey at 2 a.m. ET on Thursday, and Google and NORAD have developed many different ways to keep tabs on the jolly old elf this season. 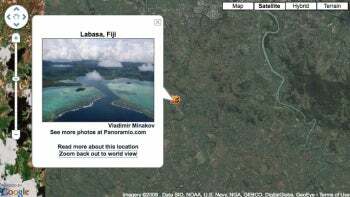 One of the best ways to do so is through the Google Earth Web browser plug-in available for Windows and Mac OS X users. On Windows, the plug-in works with Google Chrome, Internet Explorer 6 or higher, Firefox 2.0 or higher, and Flock. Mac users can use the plug-in with Safari and Firefox 3.0 or higher and some Chromium builds. Google Chrome for Mac does not currently support the Google Earth browser plug-in. You will not be able to track Santa this year using the Google Earth desktop client. Once you've installed the plug-in, go to noradsanta.org to track Santa's progress using Google Earth in Google Maps. You can follow Santa's trail of presents, called his "Sparkles Trail," to see where Saint Nick has been. Clicking on any of the present icons will give you a user-generated image in a pop-up window courtesy of Google's Panoramio. From the window, you can take a look at more Panoramio images from that stop on Santa's tour, follow a link to learn more about that location on Wikipedia, or zoom in on Google Maps to take a closer look. There are also YouTube videos you can watch along the way narrated by NORAD officers and staff. In one video, NORAD explains how they've been able to determine Santa's speed by observing the old man's sleigh by observing Santa and Japan's bullet train in relation to Mount Fuji. It turns out that Santa travels at a rate 100 times greater than the speed of the Bullet Train, approximately 17,000 miles per hour. To learn more about using Google Earth to track Santa check out Google's brief slideshow. If you don't have access to the Google Earth plug-in, you can keep up to date with Santa's travels through Twitter, the NORAD Santa Facebook page, and a Picasa Web album. 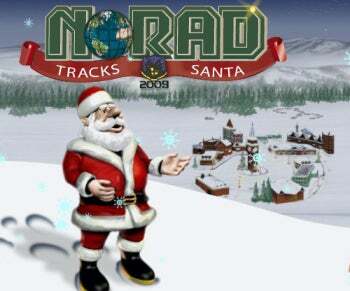 You can also use Google Maps for mobile at m.noradsanta.org or receive mobile SMS updates by entering your phone number at the bottom of the Norad Santa homepage. Each SMS update includes a link to a Google Map. There are numerous ways to track Santa thanks to Google and NORAD this season. Not only will you have some fun, but your kids will learn a little bit of geography along the way.